After yesterday’s rain, we were all pleased that the weather forecast seemed more promising for the next few days. After the minibus dropped us off at Sebergham, we followed a path across fields and then through a wooded section that contoured round the hillside above the Caldew. This section was very muddy (nothing to do with yesterday’s rain, it was all the fault of that cursing bishop! ), and one short stretch had danger signs up indicating a recent landslide. Eventually, we reached the pretty village of Caldbeck (I recognised it as the subject of a watercolour painted by my father!). We searched out John Peel’s grave in the churchyard, and then had a mini-lunch break near the river (we didn’t want to eat a full lunch before the ascent of High Pike). 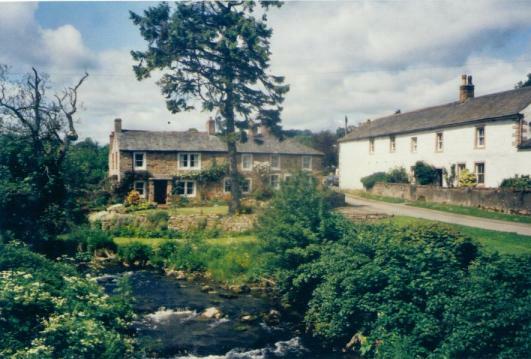 From Caldbeck, we took a short detour from the Cumbria Way to see the site of an old mill in an impressive gorge. We then crossed another field before taking a lane, steep in places, heading towards the northernmost edge of the Lakeland fells. Eventually we left the lane at a row of cottages and set off up a track heading up the steepening fell side. We took the ascent at our own pace, some a bit faster than others. About halfway up, we stopped for a water break near some old mine workings. Scotland was visible across the Solway Firth, and the view extended across the Eden Valley to the Pennines. We then struggled on up the grassy slopes of High Pike, until eventually the gradient eased and we finally reached the impressive summit cairn. Some of us were pretty glad this was the only summit we would be visiting on the Cumbria Way! Once we’d got our breath back, we managed to enjoy the panoramic views as we sat eating the rest of our lunch. Scotland, the Solway Firth, Cross Fell (highest peak in the Pennines), Carrock Fell, Blencathra and Skiddaw were all visible. Curiously enough, I had been to the top of High Pike last October, when I’d had a week’s walking holiday in the Lake District with one of my friends, although I‘d climbed it from the opposite direction after an ascent of Carrock Fell. It was interesting to try to see the route we’d taken that day as I enjoyed the views from High Pike. After a well-earned break, we resumed our journey, following the clear track southwards over a couple of small undulations before we reached Lingy Hut, a former shooter’s hut now used as a bothy. From here, a pleasant but steep descent led downhill past more mine workings to arrive at the end of a narrow road in Mosedale. We were very grateful that Patience had persuaded the minibus driver to pick us up there rather than in the village of Mosedale, as otherwise we’d have had an additional two mile road walk (off the Cumbria Way) down the valley, plus the same trip in the opposite direction the next day. It took our driver something like a twenty-point turn to turn the minibus round at the end of the road, so we could see why not all drivers were willing to meet parties there! We all agreed that today’s walk was a fantastic improvement on yesterday’s. The weather had remained dry and bright all day, warm but not too warm, and the scenery just kept getting better and better as we went along. Yesterday’s route was entirely pastoral (and pleasant enough, probably, on a dry day) but today we got into the mountains and the change in scenery was really uplifting. We got back to the hotel rather tired, but very pleased with the day we’d had.